The PIANC ExCom held on January 31, 2013 decided to give the De Paepe-Willems Award of 2013 to the paper titled "Breakwater Reinforcement Method against Large Tsunami" and authored by Mr. Hiroshi Matsushita of Nikken Kogaku Co., Ltd., Japan. Summary of the paper is shown below and full paper is attached. The Tohoku-Pacific Ocean Earthquake which occurred in March 2011 generated the huge tsunami of more than 10m. The tsunami attacked the Pacific coast of Japan serveral times and collapsed many breakwaters. Furthermore big typhoons which generate extremely big waves higher than the design one for maritime structures have sometimes appeared recently. The frequent appearance of the big typhoons may be affected by climate change due to global warning. The extremely big waves have caused serious damages to breakwater. Therefore, new methods for breakwater reinforcement are required to develop. Previously the heightening of rubble mound in the rear part of the breakwater was employed as a reinforcement method for upright breakwaters. However, because the heightening of the rear mound may expand the width of the mound to the waterway, the heightening is not preferable for safety navigation in the waterway. The stones of the rubble mound also may be carried into the waterway by the flow induced by the tsunami overflow. We have developed a counter-weight type block (named SUBPLEO FRAME) which can be expected to exert large sliding resistant force in spite of small cross-section. This block shows a square shape with a large rectangular hole in the center, and natural stones are packed in the hole. The very large resistant force caused by the friction among the stones reduces the size of the cross section of the block. In addition, the model experiments show that the blocks are stable against the tsunami overflow. Model tests of pulling the block were carried out to evaluate the friction factor of the counterweight type block. Additionally hydraulic model experiments on the motion of the block were conducted to confirm the validity of the value of friction factor. The model tests for the friction have derived the friction factor 0.75 for design. The hydraulic model experiments have concluded that the blocks designed by the friction factor of 0.75 are sufficiently stable. 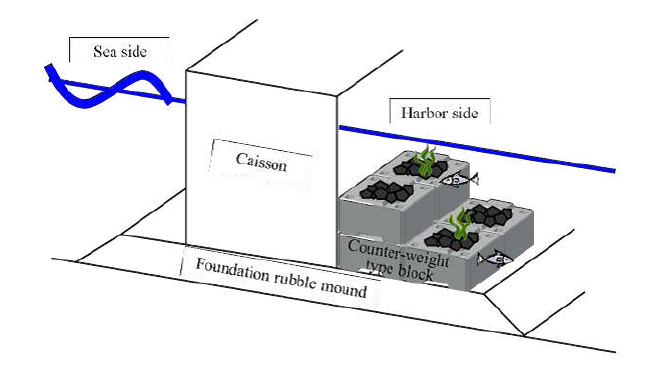 A tsunami overflow experiments were performed to check the stability performance of the counter-weight type block on comparison with the mound heightening method. As the result, the counter-weight type block shows its stability against the tsunami overflow is quite well.